The unlocked Moto G6 has just made its debut in the United States after Verizon introduced the mid-range smartphone in the country. However, unlike many other unlocked handsets, Motorola's Moto G6 is fully compatible with all major US carriers, including AT&T, Sprint, T-Mobile, and Verizon. We reported earlier today that customers can pick this one up for $250 via Motorola's online store or Best Buy. But Amazon has a slightly better deal if you don't mind having a bit of bloatware installed on the Moto G6. 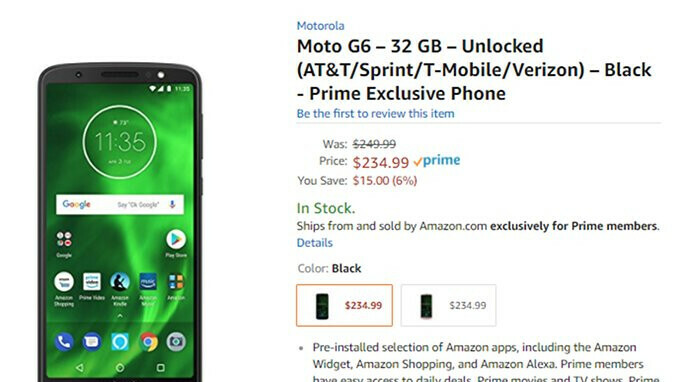 It looks like Amazon has decided to add the Moto G6 to its Prime Exclusive portfolio, so Prime members can now purchase the smartphone for just $235, only $15 cheaper than the MSRP. The smartphone is available in either Black or Oyster Blush color, but both come with a selection of Amazon apps pre-installed, such as Amazon Widget, Amazon Shopping, and Amazon Alexa. We're not sure if a 6% discount is worth the trouble, but at least you'll be able to use the smartphone with any major carrier in the US. Don't forget to check out our Moto G6 review for more in-depth details on Motorola's mid-range handset.